WHAT IS THE LEGAL AUTHORITY FOR PARTICIPATORY BUDGETING? Download the application form and submit to Jessica Bradley at Councillor Mason’s Office, more info here. Submission deadline is Monday, May 2 at midnight. Be sure to contact Melody in advance to ensure your project is eligible and your form is complete. FROM WIKIPEDIA: Participatory budgeting (PB) is a process of democratic deliberation and decision-making, and a type of participatory democracy, in which citizens decide how to allocate part of a municipal or public budget. Participatory budgeting allows citizens to identify, discuss, and prioritize public spending projects, and gives them the power to make real decisions about how money is spent. The following instructions will work ONLY if you use Google Chrome or Apple Safari web browsers. For Firefox and Internet Explorer users you can install a PDF printer, see instructions here. In Google Chrome, choose Save As PDF and proceed to download the file. In Safari, choose PDF at the bottom of the Print Dialogue Box and then select Save as PDF. Residents should know in advance that all HRM policies and guidelines must be met. There are a bunch of rules that help define what can and can’t be funded, you can read the HRM District Capital Policy here. You must comply with the District Capital Policy and have discussed your application with staff prior to the deadline. There is a limit of $20,000 that any one project can receive per year. A previous project must be complete before an organization can apply for more funds. If you are asking for funds to improve a building, the organization must own the building. District 7 was created in the fall of 2011 when the provincial Utility and Review Board (UARB) decreased the number of councillors in HRM to 16. 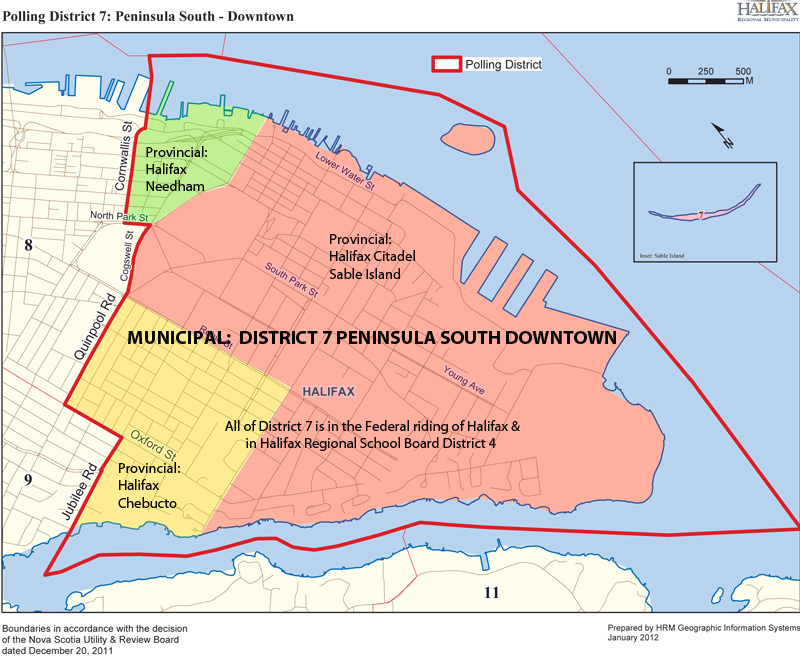 The new district name is District 7 Peninsula South Downtown. You can see an official big map of it here or you can look at a google map we created. The district is south of a boundary that runs from the Northwest Arm along Jubilee to Oxford, then north up Oxford to Quinpool, then east along Quinpool and Cogswell to North Park, north up North Park to Cornwallis, then is south of Cornwallis to the harbour. It also includes Sable Island. Regional Council adopted the HRM District Capital Fund Policy on July 31, 2007 to guide the distribution of these funds. Each year Council approves a capital budget for each district, in 2015/16 it will be $94,000 per district. Councillors have the discretionary authority to determine which organizations receive funds in the district they represent. Some Councillors have chosen to use a Participatory Budgeting process. The Participatory Budgeting process provides advice to the Councillor as to which applicants may be considered for funding. The decision of the Councillor is final.